From July 23 to August 25 I was included in the “Chain Letter” show at Shoshana Wayne Gallery at Bergamot in Santa Monica. It was a riot with so many artists, a great event that brought the community together. My sculpture landed on the front counter, a favorite of mine that I call the “Pink Puff” piece (you can see it here under mixed media). An artist from the Santa Monica Art Studios who is in my “Critique group” that I am moderating for Gallery 825 saw it in my studio and said that is the only piece that really caught her eye and stuck with her from the whole show! Wow, that’s what I call a complement, there were literally hundreds of pieces in the show. 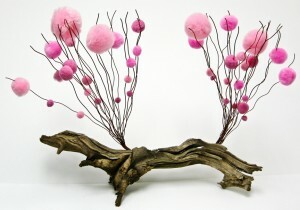 Thank you David McDonald who invited me to the show and helped to inspire the “Pink Puff” piece.